It is no secret that Pat Sloan loves to join in on a blog hop and I was so excited when Pat said, “Yes” to the nested churn dash QAL. Pat has always been a big part of my quilting life with her fabulous radio show, quilt-a-longs and always informative posts. I don’t know how Pat does it all. I am sure she has a secret army of minions tucked away in her studio. 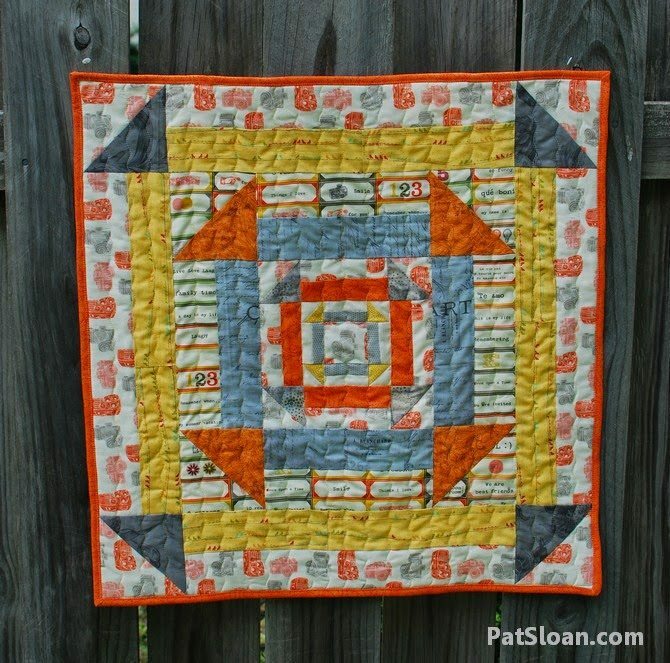 Visit Pat’s blog to see the gorgeous mini-quilt and encourage her to make a full quilt. I will make one with Pat if she takes on the challenge. Wink, Wink! P.S The quilt is yours if you come to Australia and pick it up personally. Tip / Hint 3 – Consistency and accuracy. Why are they so important? Accuracy in quilting is defined in terms of the technical definition found in the dictionary. As quilters we strive for accuracy in our measurement, cutting, piecing and quilting as a means to construct a quilt following a well researched and tested standard. In other words, quilters have repeatedly tested quilting methods to find a common technique that works over and over again giving consistent results. This consistency makes the construction process easier. Is accuracy the same as perfection? Accuracy in quilting is just one of the processes required to improve quilting to a point that is it faultless. I don’t think there is such a thing as the perfect quilt. It would not be handmade or have the human factor if it was flawless. Regardless, adhering to the tried and tested techniques in quilting will make your project much easier to assemble. Press your fabrics well to remove all creases. Creases can distort your block size. Use the same ruler when cutting all your pieces. Markings on different rulers can cause a slight discrepancy in measurement. Use a sharp rotary blade. A blunt blade will pull on your fabric when cutting. Look over the top of your ruler when cutting so you have the same view for every cut. Looking at the ruler markings on an angle can give a distorted line of site. Parallax Error. Check your seam width. Make sure you are consistent when sewing the seams. Check your finished block sizes and make sure they are the same for each block. When pressing a seam or finished block, do not distort the block by over handling and stretching. Tomorrows guest is June 12th – Lissa Alexander – http://www.modalissa.blogspot.com. Don’t forget to visit Carrie and Kim’s blogs to see their wonderful projects. Love the tw3nty thr3e fabric. I just finished a kwilt using it! This is an incredible blog hop. Jane you are amazing. Your patterns are so well written. I love all your posts! Thank you so much for inviting me along and for your amazing inspiration.